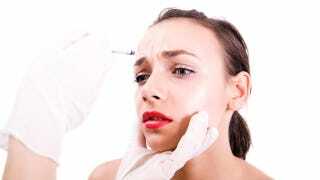 A new study says Botox may make people see you as less attractive — and not just because it can create new wrinkles in odd places. University of Toronto researchers asked people how they view women who use various anti-aging techniques, including skin creams, facelifts, and injectables. They found that compared to women who only use creams, people see Botox users as vain and cold. According to the New York Daily News, participants were divided into two groups, one with an average age of 18 and another with an average age of 70. After reading descriptions of the women and how they handle the aging process, they were asked to judge their character. Unsurprisingly, the older group were more forgiving than the teens, who seem to think they'll live forever but never look old. Yet all subjects viewed women most positively when they aged naturally, and "felt more warmth" toward the women who didn't use Botox. It would be nice this meant a new era has dawned in which people finally appreciate natural-looking older women. However, we're presuming that participants would still say a woman with lots of wrinkles on her face is less attractive. If you aren't blessed with extraordinarily good genes, and want to avoid being scorned by those around you (and random Canadians), it seems you should get a bit of Botox, but keep things natural. Then vehemently deny you've had anything done. Admittedly, it's a precarious balancing act. You may be better off accepting the fact that society is uncomfortable with women aging, and will criticize older us no matter what we do. Your best course of action may be to start working on not giving a damn.